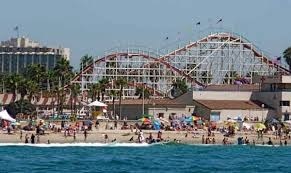 Mission Beach is San Diego’s lively take the classic boardwalk beach town with nearly two miles of oceanfront boardwalk, numerous rental shops and Belmont Amusement Park. This beach is very popular to young adults with its hot nightlife scene. There is also a host of activities for everyone, including biking, beach volleyball, all water activities, sport fishing and boating. Short distance from beach side is Mission Bay for additional aquatic fun with grassy parks, playgrounds, picnic tables and miles of sidewalks. On the bay is also Sea World San Diego, the largest park of its kind, with fireworks throughout summer months. Pacific Beach is the perfect location for the young and young at heart and where the party never ends. Enjoy walking to both San Diego Bay and beaches. In North Pacific Beach there are numerous dining opportunities and San Diego’s Crystal Pier. It offers a favorite spot for swimming, wave jumping and other water activities supervised by Lifeguards. Also has a variety of eclectic shopping opportunities. Population for Mission Beach and Pacific Beach is approximately 46,910. Average income for area is $69,875. Average price of detached houses is approximately $2,235,116.